Made with clear optical grade acrylic lenses designed for seniors, hobbyists, macular degeneration, and people with low vision. 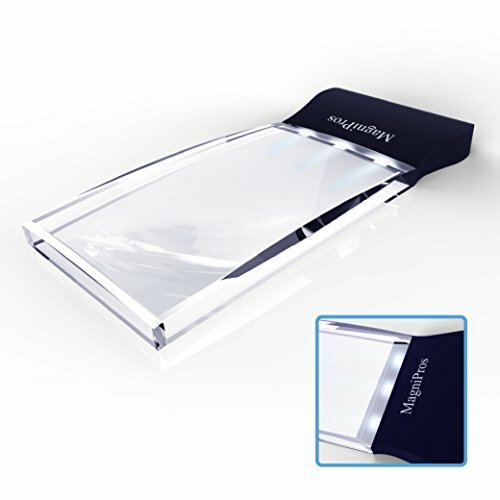 The 2X magnifying lens is considered the most comfortable magnification for reading and the 2X rectangular magnifying lens is designed for the way you naturally read words and texts. ☂Backed by a 100% No-Hassle, RISK FREE Money Back Guarantee! If you are not completely satisfied with our magnifying glass, we will give you a full refund. No questions asked. ★ HIGH QUALITY CRYSTAL-CLEAR OPTICAL GRADE LENS- It is ideal for reading small prints in books, magazines, newspapers, documents, maps, encyclopedias, etc. ★ 3 POWERFUL ENERGY EFFICIENT LEDs- Lights are powered by 3 AG10 batteries(included) and can be turned on or off with a simple switch on the side of the handle. ★ LIGHTWEIGHT & ERGONOMIC HANDLE- Constructed out of unbreakable ABS making it lightweight and sturdy, ideal for longer reading time without tiring hands. ★PREMIUM STORAGE POUCH & SATISFACTION GUARANTEE- Each package comes with a storage pouch and if you are not satisfy with the product in any way just send it back full refund will be issued no questions asked!